Hello there, sorry I am so late with today’s post. It has been a very full day here. Like you know I spent Sunday with dear friends sharing wonderful ideas, stamping, laughing and growing closer. My title should have said NO VIDEO again !!! I do like to post a fun video of what we have been up to during these fun days but unfortunately I had a bit of technology malfunction this time round and I haven't got any video footage to share with you. And to make it worst I didn’t take any pictures either , I just didn't have time to. I do however have plenty of pictures to share with you of the cute projects we did on the day. Our theme was Christmas so everything from the swaps to the projects were Christmas orientated. The swaps and demo booths were amazing and will share those with you another time. For now here’s the projects everyone did on the day. Our first card was made with the Holiday Hoopla stamp set. I love it but the sample does look a bit worse for wear, I should photograph samples before the event not after LOL. Cherry Cobbler card base, Jolly holly designer paper, baja breeze seam binding. 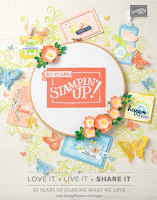 Next the star of the show, the cutest 3D item made with our pillow die, scallop circle die and punches. Everybody loved this sweet hanging treat, it was my favourite project as well. I have cased it from one similar made by LeeAnn Greff a fellow US demonstrator. I love this card and I think the attendants on Sunday did as well. Contempo Christmas stamp set and the sentiment from the Gifted stamp set. The music wheel was used to add a background behind the frame, which was made using the new decorative label punch. We edged the frame with ultra fine silver glitter for sparkle and glamour. Baja Breeze, Sahara Sand and Very Vanilla. Next a fabulous twisted card holder that Bekka designed for us all, jolly holly holiday papers, it looks very impressive yet quite easy to construct, FUN. we had a fabulous day but then we always do, there is nothing more fun than sharing and seeing everyone bond and form friendships over this amazing hobby, I am truly blessed and very lucky for having Stampin’Up! in my life which brings me in contact with so many amazing women that I am honoured to call friends. Did you know that July is the best month to sign up as a demonstrator? I would love to welcome you to our team of Passionettes. Email me if you are interested, I would love to have a no pressure chat with you about it. Wow! They all look amazing Monica. It's a shame about the video but it sounds like you all had an amazing time anyway.